From Memories of Sherlock Holmes, "The Naval Treaty"
During our recent visit to Belgium our son drove us (grandmother and the grandsons, John and Andrew) to the south of Holland to visit the world’s largest flower garden at Keukenhof. 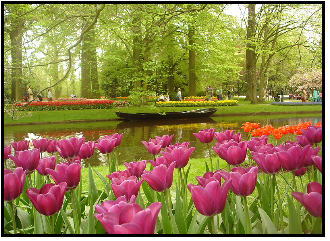 Approximately 7,000,000 (seven million) flower bulbs are planted annually in the park. The temptation to take pictures easily gives way to the no-cost digital camera snapshot. 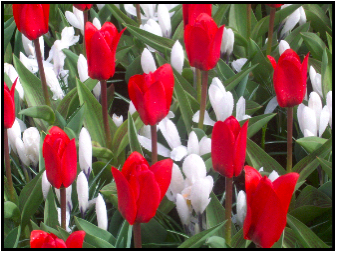 Here is just one of the many tulip pictures I clicked off. It takes a full day just to walk through the park. To see every nook and cranny, walk through the mazes, watch every event, feed the swans, and enjoy all the park has to offer would, in my mind, take two to three days. 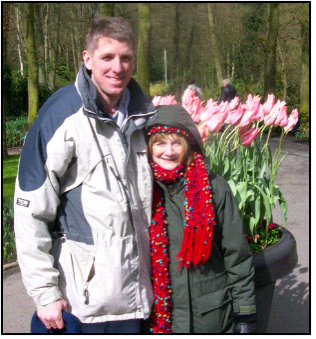 Even though it was mid-March when we visited, the park was already signaling that Spring was on its way. Bundled up against the cold wind, grandmother and the boys occupy the single chair on an island deck. Purple seemed to be the boy's favorite color. 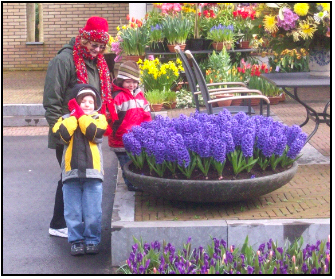 To follow up on our visit to Keukenhof, in the next two posts I will share two ‘flower’ activities initiated by two of our grand kids.